Over sunrise and sunset, the Sneads Ferry high-rise bridge enhances the panoramic view of the quaint fishing and farming community. Encapsulated by the pine forests and the New River, families from England, Scotland, and other areas in Europe found passage and refuge in this area. Men sailed and rowed boats along the banks and toiled on the sea. Even today, the early morning fishermen are on their boats, mending nets, fixing their rigging, and gearing their engines for the weeks or months they will be gone. Since 1941, the U.S. Marine Corps base at Camp Lejeune has expanded and boosted the real estate of the township. 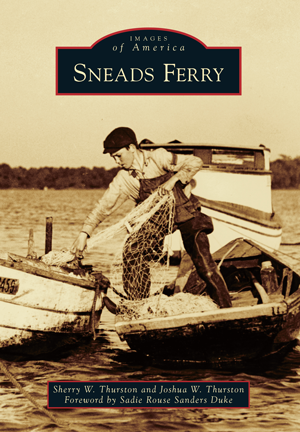 The photographs in Images of America: Sneads Ferry recount the memories and the emotions of a simpler time. Sherry W. Thurston has her bachelor's of science in art education and has owned the Thurston Art Gallery in Sneads Ferry for 30 years. She is an accomplished artist, illustrator, and teacher. The coauthor and Sherry's son, Joshua W. Thurston has his master's of arts from the University of North Carolina at Charlotte and his bachelor's of arts from Hampden-Sydney College. He is a Spanish translator and teacher. Through their research, Sherry and Josh have interviewed many Sneads Ferry residents, and their goal is to honor the town and its people.